In 1880, Marie Berna had only been married a short time when her husband, Dr. George Berna died. To commemorate his life she visited the then unknown artist, Arnold Bocklin at his studio in Florence to commission a painting. He at first suggested he’d paint something to cheer her up, a happy scene. She preferred something more serene, as a theme of her bereavement. 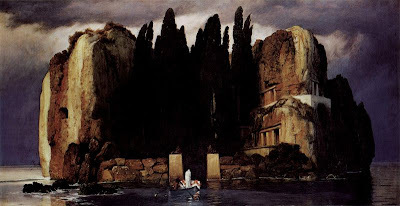 Arnold Bocklin referred to his work as A Still Place, A Silent Island and Island of the Graves. He told Madame Berna, "Its influence is so quiet that one is startled if there is a knock at the door." Later an art dealer by the name of Fritz Gurlitt provided the title, which it is now known by: Isle of the Dead. We see a boatman rowing into the darkness. At the center a figure in white stands over a coffin draped in white. The stillness of the work has touched many over the years. In fact Adolf Hitler purchased one of Bocklin's five versions. It was hanging on the wall of his study in the bunker he committed suicide in. Vladimir Lenin and Sigmund Freud had reproductions on their walls as well. What is it about this painting that such infamous people in history have owned it? What in this work haunts the viewer? Sergei Rachmaninoff saw a black and white reproduction in a gallery in Paris in 1907 and immediately went to work on his own musical expression entitled, "Isle of the Dead". Listen to this clip from his 1909 work while you study the painting, and hear the lapping waves against the ferryman's boat as he enters the Isle of the Dead. One must ask, are we left with the same peaceful stillness the artist intended? Or a foreboding since of doom? I have been a reader of Pallimed for over a year, since I started my blog on hospice and nursing homes. An author and hospice volunteer, I welcome this artistic approach to palliative care content. What a nice balance it provides! I think implementing Pallimed: Arts & Humanities is an excellent strategy for informing a wider and more diverse range of people about palliative care. I look forward to your future posts. Sometimes, reading Pallimed articles, I feel like a teeny tiny creature under a microscope, being viewed by cold, clinical eyes. Other times though, I feel really small. Would a dying man be allowed to post a wee poem here? Or does one need to be both dead and famous first? If so, the first is merely a matter of time; I have no control whatsoever over the second part of the question. As for the painting, it brings to my mind the imagery of a journey to a safe, quiet, peacful place; albeit with some fear involved in the journey there. But it's alway the journey that's exciting, isn't it; the arrival is a non-event - for the traveller. Writing - prose or poetry - provides some of us with a way of exploring, explaining, lamenting, loving and leaving. It may not be good; but it is honest. Richard- Thank you for sharing your beautiful prose and poetry. I hope you continue to share in the future. We are planning to have more posts in the future specifically looking at the poetry/prose of different palliative themes (both living and dying themes). From another creature under the microscope... thank you. Do you know if this painting is been in exhibition in the United States? However, one of the five versions is housed at the Metropolitan Museum of Art. Though I'm not sure if it's on display right now.